Snow and ice impacts are the newest area of research for the Hazard Impact Modelling project lead by the Met Office. The aim is to develop a snow and ice hazard impact model (HIM) initially focusing on the UK road network. The model will use meteorological forecasts of snow and ice combined with vulnerability and exposure values to give a risk value. The research has highlighted the complex meteorology behind snow and ice forecasting and how salting the road network can have a dramatic affect on the impacts of snow and ice especially if rainfall is forecast at similar times. This makes the hazard section of the impact model challenging from the start. Using case studies, an analysis of the amount of snow and ice which causes impacts has also been undertaken and shows that very little is required to cause numerous impacts. These values will be used as impact thresholds in the model. The most appropriate vulnerability and exposure data is still to be determined however research in this area is continuing. A comprehensive report has been written about snow and ice impacts including detailed recommendations for creating a new snow and ice Hazard Impact Model. Hazard Impact Models (HIMs) for wind and surface water flooding have been created with a landslide model in development. The Natural Hazards Partnership is looking to extend this modelling capability to cover other hazards including snow and ice. The aim of this report is to provide an initial scoping of the potential for modelling the impacts of snow and ice. 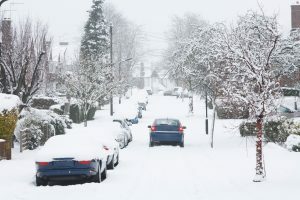 This has been done by investigating studies which have already been done on impact thresholds for snow and ice, looking at case studies for different snow and ice events across the UK to either verify such thresholds or to identify appropriate new thresholds, and investigating the capability to forecast snow and ice. It was found that the road transport system is the most vulnerable to snow and ice and therefore formed the basis of the report. Impacts on the road transport system tend to start when the efficiency of salting of the road network is compromised. A number of meteorological situations in which this is likely to happen were identified, with freezing rain considered the scenario most likely to result in widespread ice. External factors were also identified for which the likelihood of impacts increases, such as time of day, day of the week etc. Case studies of snow and freezing rain events were investigated and a summary of these has been created for comparison. Some initial impact thresholds were identified with certain precipitation rates tending to result in similar levels of impacts. These impact thresholds were compared to those already used by the Met Office Ensemble Prediction System first guess Warnings (EPS-W) and whilst the level of impact for many of the events matched up, there were a few events where the expected level of impacts differed from the actual level of impacts which occurred. This supports the idea that thresholds based on snowfall amounts alone cannot be used for impact based warnings, with a complex mix of other factors contributing towards the resultant impacts. Based on this and other findings, a number of suggestions have been made for further areas work.